BC Ferries’ 21,958gt/1993 built Spirit of British Columbia (above) returned to service on 7th June on the Metro Vancouver (Tsawwassen)-Victoria (Swartz Bay) route following the completion of a mid-life upgrade at the Remontowa Shiprepair Yard in Gdansk, Poland. The vessel had returned home from Europe on 5th May. Sistership Spirit of Vancouver Island will undergo her own mid-life upgrade from autumn 2018 to spring 2019. The vessel is the first of two to be converted to operate on LNG and is the first passenger vessel in the world to refuel LNG via delivery on a fully enclosed vehicle deck. The Salish Class vessels introduced last year were the first passenger vessels in the world to fuel LNG on an open vehicle deck via delivery truck. 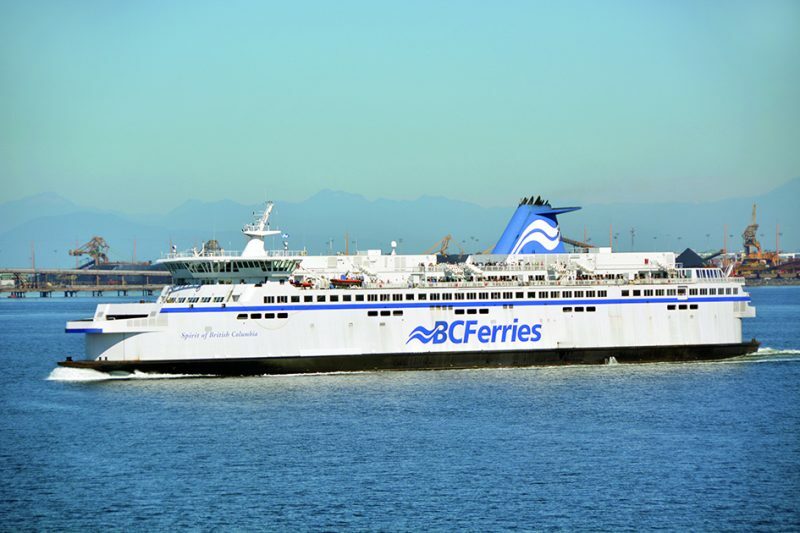 Both of these innovations were conceived by BC Ferries and designed, engineered and built by BC Ferries and its partners. The LNG is provided by FortisBC and can be reliably delivered in British Columbia. Other upgrades included the renewal of navigation equipment, propulsion equipment components including gearboxes, rudders, steering system, bow thrusters, propeller blades, LED lighting, more efficient air conditioning equipment to reduce energy consumption and four marine evacuation systems. In addition to the LNG conversion, BC Ferries upgraded the vessel’s passenger areas with new carpeting, furniture upholstery, new table tops, added a new Arbutus Coffee Bar on Deck 6 and doubled the size of the Passages onboard shop. CalMac announced in May that the new and long-awaited propeller shaft from Denmark for the Clansman would be fitted during a dry docking in Greenock between 1st and 12th June resulting in a return to service on 13th June. In the ship’s absence there had been an amended service on the Mallaig Armadale route and the Mallaig Lochboisdale route was suspended. Additional sailings were provided on the Barra to Eriskay route enabling passengers to travel to South Uist via Oban-Castlebay on the same day. The Loch Bhrusda was also deployed on the Skye route to provide additional sailings for the duration of the maintenance period. Clyde Marine Services has resumed the Gourock-Kilcreggan ferry service using the Chieftain, the vessel originally built to replace the Kenilworth on the service. More recently the former Lymington based passenger vessel Island Princess was used on the route but reliability dropped to unacceptable levels.